Patoleo (singular: Patoli) are turmeric leaf cakes, a dish which is mostly prepared on the western coast of India and other Indian Ocean islands. It is made of grated coconut, rice and jaggery, and cooked by wrapping and steaming in turmeric leaves. A home-made dish of sweet Patoleo, cooked in the style of the Chitrapur Saraswat Brahmin community. Konkani-speaking Hindus prepare Patoleo on the second Sunday of Shravan, on Nag Panchami and on Hartalika, the eve of Ganesh Chaturthi. Salt-free Patoleo, are offered to Goddess Parvati, who according to a legend, is said to have a strong craving for these sweets during her pregnancy. Served with leaves on, in a dish. They are mainly eaten after removing the leaf and are eaten with the vegetarian festive lunch during the Hindu festivals. 'Patoleo' prepared in Goan Catholic style. Pièce de résistance of the Assumption feast celebration. 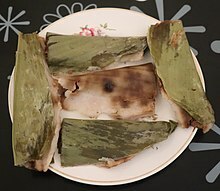 The simplest version of the Goan Catholic Patoleo is prepared by smearing parboiled rice (ukadeñ tândul) paste on fresh turmeric leaves (holdi pân) to which a filling of freshly grated coconut (choon) and coconut jaggery (mâddâchõ godd) is added. Lastly, the leaves are folded, sealed and steam cooked, preferably in a traditional utensil known as chondrõ. These are served hot on a platter with the leaves on and eaten after peeling them off. They are often accompanied with tea or other hot beverages. The Catholic feast of the Assumption of the Blessed Virgin Mary (a holy day of obligation) which falls on the 15th of August coincides with the Independence Day of India. It is a feast held dearly by the Goan Catholic community, as many villages across Goa celebrate Konsâcheñ fest (harvest festival) on this day and Patoleo are the star dish of the celebration. It is also prepared in Goa on the feast of São João (Nativity of St John the Baptist) which falls on the 24th of June. Patoleo are sent with Vojeñ (bride's trousseau) to the bridegroom's house by the Goan people—Catholics and Hindus alike. The tradition of distributing Patoleo to neighbours and friends after the arrival of a new born in the family is still retained by some Goans. In bygone times, Patoleo were also distributed to mark the completion of construction of a house in Goa. Some Goan Catholic families send Patoleo to a house where people are mourning the death of a family member. The East Indian Catholics call it Pân Mori or 'East Indian leaf cakes'. The Mangalorean Catholics say Patoley in their accent. This page was last edited on 23 August 2018, at 12:11 (UTC).